The Zeekeeper is a character who appears in Mario & Luigi: Dream Team. He is the guardian figure of the Pi'illo Kingdom, who helped them take down Antasma many thousands of years before the events of the game. The name is derived from the word "beekeeper" through a combination of the American English phonetic spelling of the letter Z, which symbolizes sleep, and the word "keeper", referring to his status as a guardian. Prior to the events of Mario & Luigi: Dream Team, the Zeekeeper protected Pi'illo Island from danger. He later helped Dreambert and the other Pi'illos take down Antasma and seal him away inside the Dream World, in Dream's Deep. When Mario, Luigi, Peach, Toadsworth and all the other main characters arrive on the island though, the Zeekeeper (much like the Pi'illos themselves) is nowhere to be found, with him being considered to be a legend by those still inhabiting the island. For the first half of the adventure, he's only mentioned in books, on signs and as part of the island's history. When Peach is captured and taken to Neo Bowser Castle, Mario, Luigi, Starlow and Dreambert return to Pi'illo Castle when they hear Dr. Snoozemore has returned, who tells them that finding and bringing back the Zeekeeper could let them destroy the castle's barrier and confront Bowser and Antasma. They then go to Dreamy Pi'illo Castle to search for clues to his whereabouts, finding a statue that says the Ultibed is needed to summon him. After the pieces have been assembled, Bedsmith is freed and the Ultibed's assembly in Somnom Woods, Mario and Luigi head to the Pi'illo Temple, using the Ultibed to enter Dreamy Somnom Woods. Here, they find the Zeekeeper's egg on top of the tree, smashing it open and bringing back the Zeekeeper. At this point though, the Zeekeeper mistakes Mario and Dreamy Luigi, for intruders, attacking them as a result. This causes another Giant Battle to start, with Dreamy Luigi eventually defeating him with Finishing Bros.
After his defeat, the Zeekeeper has immediately gained respect for Luigi and congratulates him on his victory, then notices Dreambert with the Bros., and reverts to his usual, casual attitude. He then hears about the situation in the Real World, and eventually agrees to attack Neo Bowser Castle once Mario pays his 80 million coin fee. However, this fee isn't directly paid for by Mario in the end. The Zeekeeper fires his Wakebeam at Neo Bowser Castle. He then attacks Neo Bowser Castle, using his Wakebeam to shatter the forcefield surrounding it, which causes the whole location to come crashing down to a spot just north of the Somnom Woods entrance. The Zeekeeper then rests on a spot near the Somnom Woods entrance afterwards. 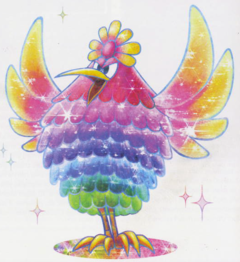 The Zeekeeper later appears in the ending, saving Mario and the rest of the party from the collapsing castle after defeating Dreamy Bowser, as well as creating a giant Dream Coin to replace the now broken Dream Stone. He then shatters it and causes millions of coins to start raining from the sky, with the explanation that it is better the inhabitants pay for their wishes rather than rely on the risky in the wrong hands powers of the Dream Stone. Additionally, if Mario and Luigi save all 52 Pi'illos and speak to Eldream in Mushrise Park, the Zeekeeper, upon the request of Eldream, agrees to help the two in battle in the form of Mario's final Bros. Attack, the Zee Egg. Pi'illo Island's mascot is said to be the Zeekeeper. The island folk dress up in Zeekeeper costumes to greet Princess Peach to the island. The Zeekeeper is a large bird-like creature with a long beak, three eyes and skinny legs. 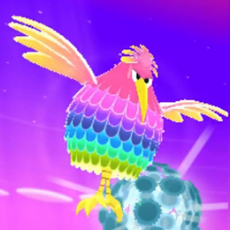 His egg-shaped body is adorned with rows of colorful feathers, which change colors as they go down his body - pink at his head, blue near his middle, and green at the base. He also has a small plume of yellow-pink feathers on his head, above his oval white eyes. When dizzied, his eyes show a sequence of expanding red and yellow rings, when he activates the Wakebeam, a third eye is seen at his upper plumes, known as his "Mind Eye". The Battle Ring's version of the Zeekeeper, Zeekeeper X, has the same body shape as the Zeekeeper, but with an altered color scheme. His feathers are purple near the head and fade to yellow above his legs, and his eyes are black with white pupils instead of the reverse. At first, the Zeekeeper seemed to have the personality of a serious guardian, speaking in a formal manner and being very confident in his own abilities. He was dismissive of Mario and Luigi, although he complimented them on their bravery in challenging him. As the battle went on and Giant Luigi gained the upper hand, he became increasingly impressed with his opponents' skill and strength, frequently commenting on how far they had pushed his powers. After being defeated and meeting Dreambert, the Zeekeeper was revealed to be much lazier, greedier, and more laid-back than he first appeared, with a "surfer dude" way of talking. He treats Antasma as not much of a threat, not really wanting to bother to save the island and is rather loud in general. He's also a bit more fond of material wealth than Mario and co expect, asking for 80 million of Mario's coins to take down Neo Bowser Castle and eventually turning the remains of the Dream Stone into a giant Dream Coin instead of rebuilding it, and has the tendency to charge people for his aid. He however does have a good heart, and was willing to help out in the end, as seen when he saved Mario, Peach, and Luigi from falling to their deaths and deciding not make Mario and co pay him the 80 million coins, and also having the sense to know having a Dream Stone is a dangerous idea, and that it would be better to not rely on such things. He later shattered the Dream Coin into a rain of coins for all the people of the island to use to buy their wishes, and in creating the coin rain he created a new tourist attraction for the island, showing that he may not have been as greedy as he let on, although still having a great appreciation for coins. The battle with the Zeekeeper involves Luigi having to take him down while he flies, similar to the battle against the Fawful Express in Mario & Luigi: Bowser's Inside Story. In order to get the Zeekeeper down to ground level and susceptible to Luigi's attacks quickly, Luigi must dodge enough of the Zeekeeper's attacks to get close enough to be able to leap at his legs, grab them, slow him down and eventually slam him into the ground, damaging him a bit and allowing Luigi to have two attack turns before the Zeekeeper takes flight again. The Zeekeeper releases explosive eggs at Luigi. The Zeekeeper can fly at Luigi in an attempt to ram him mid-flight. Before he hits (or misses) Luigi, the Zeekeeper will move to either a high or low altitude, often later in battle doing a high loop before deciding in an attempt to throw off Luigi's timing. Luigi must duck under or jump over the Zeekeeper to avoid this, via the player sliding the stylus downwards or upwards on the Touch Screen respectively. If Luigi gets hit by this once, the attack will end. The Zeekeeper can also lay explosive eggs at Luigi while he runs after him, which Luigi will then have to be hit back with the hammer as they approach Luigi in one of three lines, via the player tapping the on-screen circles before Luigi's current position. On occasion, Mushrooms may appear during this attack, and if left unattended to, will heal Luigi slightly. All eggs that are knocked away explode near the Zeekeeper for minor damage each. Luigi dodging the energy balls. The Zeekeeper can also create a pattern of moving energy balls in the sky that Luigi will have to destroy by throwing tree stumps at them, especially when they're clustered. He may also create a single large energy ball that moves in a set pattern and requires to be hit several times to be destroyed, with each hit it gets smaller and weaker. Not destroying the energy balls result in the energy balls flying into Luigi and damaging him, while succeeding in destroying them all will allow Luigi a moment to rapidly throw tree stumps at the Zeekeeper to deal damage to him, ending the barrage of thrown stumps with an especially large one that will deal even more damage. At one point in the battle, the Zeekeeper will start to open up dimensional rifts and be followed by Luigi into one. Inside, Luigi flies around in zero gravity and must dodge the energy balls Zeekeeper fires from in front at him, as well as the occasional spinning ram attack he does after firing 2-3 waves of energy balls, which Luigi can counter after dodging him, starting to spin like the Zeekeeper once did, and ramming into him. 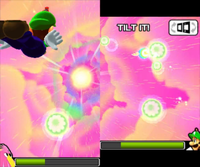 The player controls Luigi by tilting the 3DS throughout this segment. After Luigi gets close enough, he will leap towards the Zeekeeper and grab his legs, landing on the ground and breaking into a skid. 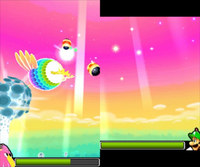 The Zeekeeper will continuously try to flap back into the air as Luigi pulls him down, and the player will have to rapidly slide downwards on the Touch Screen with the stylus to slow the Zeekeeper down. Eventually, the Zeekeeper will start to have his legs break free every so often, Luigi having to grab the free leg when it gets within range (via the player tapping the Touch Screen with the stylus). If Luigi fails to stop the Zeekeeper, he will break free and continue to perform attacks until Luigi gets another chance to try and bring him down. After several successful rounds of Luigi keeping a grip on both legs and slowing the Zeekeeper down, Luigi will slam the Zeekeeper into the ground and stomp him, leaving the Zeekeeper dazed and allowing Luigi to have two attack turns. The Jump, Hammer Chop and Hammer Uppercut are all equally effective in dealing damage to the Zeekeeper while he is in this state, the Drill Stomp being the most effective of them all. Regardless of how many of Luigi's attack turns pass since the last usage of either the Drill Stomp or Rhythm Mushroom moves, he will always be able to perform either one whenever Luigi brings down the Zeekeeper. When the Zeekeeper gets to a low enough amount of health, he will collapse and sit up dazed if Luigi is pursuing him or will continue being dazed if Luigi had attacked him with one of his attacks. The Zeekeeper will then be susceptible to being finished off by Finishing Bros. In the Hard Mode, there are some noticeable changes in the boss battle with the Zeekeeper. For one thing, there are no Mushrooms in the section where the Zeekeeper shoots eggs at Dreamy Luigi, meaning that the player cannot recover any health without wasting one of their own turns. In addition to this, the Zeekeeper also has changes in his other attacks, with him changing direction mid flight in his charge attack more often and the energy balls in the tree stump attack moving in faster and more erratic patterns. These changes carry over to the Battle Ring in this version of the adventure. "I am the legendary Zeekeeper... The guardian of the Pi'illo Kingdom..."
"Those who hinder me will become one with the light!" "You would fight me? Very well, then... Marshal your power and...try to stop me!" "Do events go ill in the real world?" Long ago, here on Pi'illo Island, a great kingdom flourished at the peak of prosperity. The Zeekeeper is believed to be the guardian deity of that kingdom. Nemurūgo From 眠る nemuru (sleep). French (NOA) Morphibou From morph and hibou (owl). French (NOE) Protodor From protecteur (protector), and dort (sleeps) or d'or (golden). Portuguese Dodorminhoco From Dodo and dorminhoco (sleepy). The Nomnoms of Somnom Woods revere a deity known as the "Watchoverer", which may be what the Zeekeeper is known to them as. At the beginning of the game, a character in a Zeekeeper costume exclaims, "I have excitement! ", a nod to Fawful's quote, "I HAVE FURY!" and its many variations. This page was last edited on January 27, 2019, at 16:28.